At LogSentinel, we are passionate about giving our clients the top-notch data protection they need. This is why we are proud to announce that FinancesOnline, a premier directory for business software, has certified us with the prestigious 2019 Rising Star Award and the 2019 Premium Usability Award. 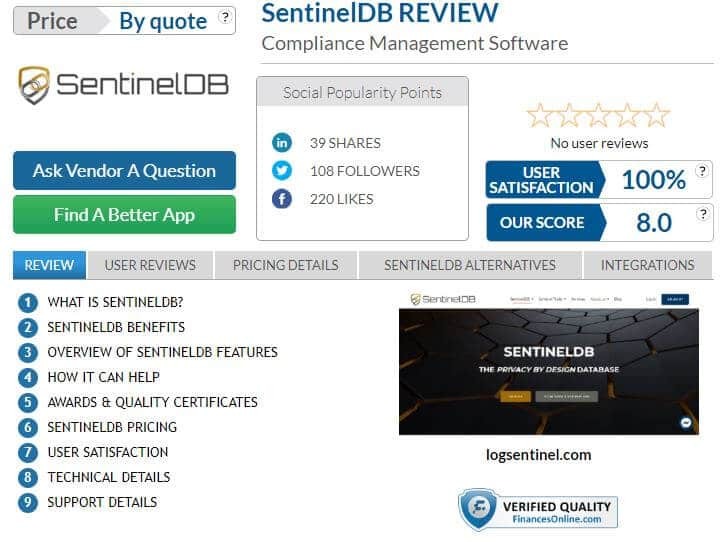 In their evaluation of the SentinelDB features, experts of FinancesOnline tested it against some of the leading compliance management software applications on the market. After much deliberation, they gave us an overall user satisfaction rating of 100% and dubbed us as one of the most reliable alternatives to other software applications in the industry. This is because of our easy-to-use interface, per-record encryption approach to data organization, and blockchain-inspired technology. With these, users can easily and securely store their data while keeping them accessible at all times. They also commended our product for its robust set of features which include user management, encrypted search, data versioning, and pseudonymization. According to them, these tools allow users to simplify the prevention of data breaches and maintain compliance with security regulations like the GDPR and the HIPAA. What’s more is that, with our platform being completely cloud-based, we allow easy and cost-effective integration, as well as reduce hardware maintenance and on-site support. If you are asking yourself, what is SentinelDB specifically, and how it can be used to improve your compliance efforts, read the full review on FinancesOnline and start using our data security solutions today. We look forward to doing business with you! This entry was posted in Awards, Data Protection, GDPR, HIPAA, Privacy by Design and tagged compliance award, finances compliance software, GDPR software, PCI DSS software, premium compliance management software, security awards. Bookmark the permalink.